LOI-2 lowered our apogee down to ~2200 (we’ll have to wait for some more tracking to verify that exactly). A test of high-bandwidth optical communications from lunar orbiter to earth stations succeeds. There was no “Mr. Watson—come here—I want to see you” moment. But a pioneering space-based optical communications test has proven a big success. And that means optical systems stand a higher chance of not only dominating future space data transmissions (with radio systems serving as a backup) but of enabling new satellite networks that would boost the capacity of the terrestrial Internet. Ground-based detectors were set up in California, New Mexico, and on one of the Canary Islands. The big trouble spot for sending optical signals through the air is that they can be blocked by clouds. Still, in the future, networks of satellites could transmit data among each other and then to ground stations in various places, giving a bandwidth boost to the ground-based fiber network. In the early morning hours of Oct. 18, NASA’s Lunar Laser Communication Demonstration (LLCD) made history, transmitting data from lunar orbit to Earth at a rate of 622 Megabits-per-second (Mbps). That download rate is more than six times faster than previous state-of-the-art radio systems flown to the moon. LLCD is being flown aboard the Lunar Atmosphere and Dust Environment Explorer satellite known as LADEE, currently orbiting the moon. LADEE is a 100-day robotic mission designed, built, tested and operated by a team from NASA’s Ames Research Center in Moffett Field, Calif. Its primary science mission is to investigate the tenuous and exotic atmosphere that exists around the moon. LLCD not only demonstrated a record-breaking download rate but also an error-free data upload rate of 20 Mbps. The laser beam was transmitted the 239,000 miles from the primary ground station at NASA’s White Sands Complex in Las Cruces N.M., to the LADEE spacecraft in lunar orbit. This breakthrough technology has a laser-based space terminal that is half the weight of a comparable radio-based terminal while using 25 percent less power. These first tests of the month-long demonstration have included the successful LLCD transmission, by pulsed laser beam, of two simultaneous channels carrying high-definition video streams to and from the moon. Proving the capability to communicate with multiple locations, LLCD successfully transmitted its beam several times to NASA’s Jet Propulsion Laboratory’s Optical Communications Telescope Laboratory in California. Soon testing will also include transmissions originating from the European Space Agency’s (ESA) Optical Ground Station in Tenerife, Spain. The tests also confirmed LLCD’s capability of providing continuous measurements of the distance from the Earth to the LADEE spacecraft with an unprecedented accuracy of less than half an inch. “We hope this demonstration validates the capabilities and builds confidence in laser communication technology for consideration on future missions,” said Cornwell. Future testing will include how well the system operates in optically stressed conditions such as daytime (all operations have been at night), full moon verses new moon, and different pointing positions for the ground terminals. “These series of tests will allow us to sample different conditions to demonstrate the flexibility of the technology,” said Cornwell. The LLCD system was designed, built and being operated by the MIT/LL team in Lexington, Mass. LLCD is managed by NASA’s Goddard Space Flight Center in Greenbelt, Md. The LADEE spacecraft was built and operated by NASA’s Ames Research Center in Moffett Field, Calif. Additional ground terminals have been provided by NASA’s Jet Propulsion Laboratory in Pasadena, Calif., and ESA in Darmstadt, Germany. NASA’s laser communications between LLCD and Earth ground stations is the longest two-way laser communication ever demonstrated. It is the first step and part of the agency’s Technology Demonstration Missions Program, which is working to develop crosscutting technology capable of operating in the rigors of space. The Laser Communications Relay Demonstration (LCRD) is the follow-on mission, scheduled for launch in 2017. Also managed at Goddard, LCRD will demonstrate laser relay communications capabilities for Earth-orbiting satellites continuously over a period of two to five years. "LLCD is the first step on our roadmap toward building the next generation of space communication capability," said Badri Younes, NASA's deputy associate administrator for space communications and navigation (SCaN) in Washington, which sponsored LLCD. "We are encouraged by the results of the demonstration to this point, and we are confident we are on the right path to introduce this new capability into operational service soon." ESA’s Optical Ground Station in Spain’s Canary Islands was upgraded with an advanced laser terminal developed in Switzerland and Denmark that can communicate with LADEE using highly focused beams. “We acquired the first signals from LADEE on 26 October, and since then, we’ve had a series of optical uplinks and downlinks providing extremely fast laser communications,” says Zoran Sodnik, ESA’s project manager for the laser effort. The contact with Tenerife came just days after LADEE made history on 18 October in the first-ever laser transmission from lunar orbit, picked up by a NASA station at White Sands, New Mexico, USA. The craft is also transmitting to a third station, at NASA’s Jet Propulsion Laboratory in California. Laser communications at near-infrared wavelengths may be the way of the future when it comes to downloading massive amounts of data from spacecraft orbiting Earth, Mars or even more distant planets. Laser communication units are lighter and smaller than today’s onboard radio systems, promising to cut mission costs and provide opportunities for new science payloads. “The participation of the ESA ground terminal at Tenerife in NASA’s project is an important milestone in this new capability,” said Badri Younes, deputy associate administrator for space communications and navigation at NASA’s Headquarters in Washington DC. With the first two communication passes with LADEE on 26 October and six more to 29 October, the ESA team on Tenerife are tweaking the station hardware – especially for the uplink – and improving procedures. “Some initial difficulties with the extremely accurate pointing necessary for laser communication are being investigated, but this is quite normal at this stage,” says ESA’s Klaus-Juergen Schulz, responsible for ground station systems at the European Space Operations Centre, Darmstadt, Germany. During the coming weeks, ESA engineers will test uplink communications at 20 Mbit/s and obtain accurate ‘time-of-travel’ measurements to be used for calculating the spacecraft’s orbit. Using special equipment from the DLR German Aerospace Center’s Institute for Communication and Navigation, the team will monitor atmospheric conditions during transmission and learn how to improve performance even further. 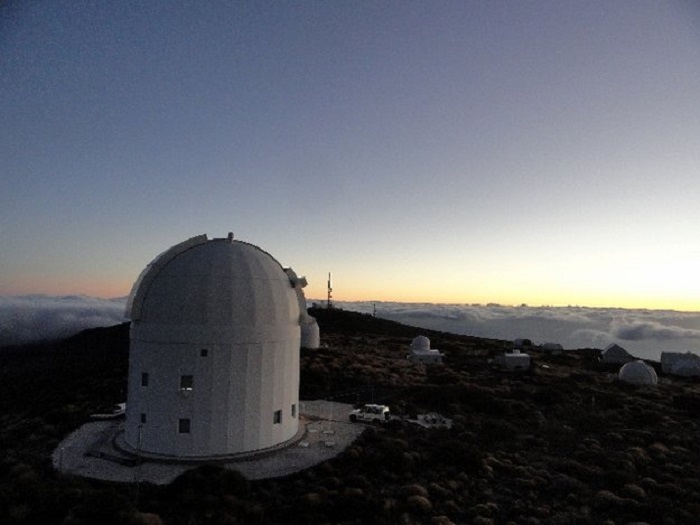 ESA's Optical Ground Station (OGS) is 2400 m above sea level on the volcanic island of Tenerife. Aside from experiments for quantum communication and teleportation, the OGS is also used for standard laser communication with satellites, for observation of space debris or for finding new asteroids. Now in orbit around the moon, NASA's newest lunar mission has completed the commissioning phase, and its science instruments have passed their preliminary checks. The Lunar Atmosphere and Dust Environment Explorer (LADEE), launched Sept. 6, 2013, carries three science instruments designed to gather detailed information about the structure and composition of the thin lunar atmosphere and determine whether dust is being lofted into the lunar sky. A thorough understanding of these characteristics of our nearest celestial neighbor will help researchers understand other bodies in the solar system, such as large asteroids, Mercury, and the moons of outer planets. “This is very promising for LADEE’s science phase – we are already seeing the shape of things to come,” said Rick Elphic, LADEE project scientist at NASA’s Ames Research Center in Moffett Field, Calif., the center that is managing the mission. The mission's commissioning phase lasted roughly one month, a period in which the spacecraft remained in a high-altitude preliminary orbit and the instruments were turned on, checked and calibrated. All three science instruments are in good health, according to the mission's payloads manager, Robert Caffrey at NASA's Goddard Space Flight Center in Greenbelt, Md. "The sensitivity of the instruments is very high, and we are looking forward to an exciting science phase!" The Lunar Dust Experiment (LDEX), built to collect and analyze lunar dust particles in the moon's thin atmosphere, is fully operational. The instrument recorded its first dust hit within minutes after its cover was deployed on Oct. 16. In subsequent orbits, LDEX observed dozens of dust particles, indicating an impact rate on the order of one hit per minute. 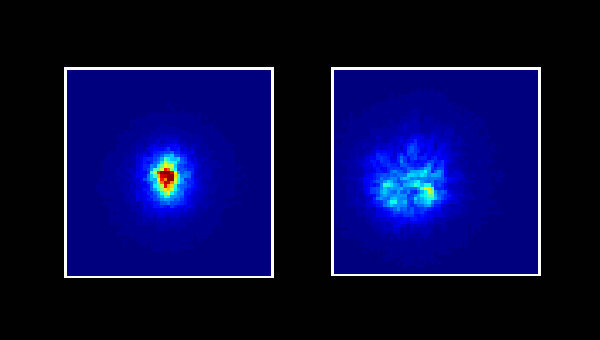 Preliminary analysis suggests the particle sizes are much smaller than one micrometer in radius. The Ultraviolet and Visible Light Spectrometer (UVS), designed to probe the composition of the lunar atmosphere, made its first measurements shortly after the telescope door opened on Oct. 16. The instrument has been performing as expected and has conducted a series of pointing and instrument-performance calibrations, including looking at the limb of the moon and performing solar crossings by aiming the solar viewer at the sun and panning back and forth. The Neutral Mass Spectrometer (NMS), which will measure variations in the lunar atmosphere over multiple lunar orbits, is operating normally. One of the first steps in getting the NMS ready for science measurements was to remove the cover of the instrument and expose the mass spectrometer to the lunar atmosphere. To do this, a pyrotechnic device was commanded to fire, breaking a ceramic to metal to ceramic seal, and the cover flew away from the spacecraft. Sensors on the spacecraft detected a small amount of motion caused by this event, and measurements made before and after the cover deployment showed that trapped calibration gases had indeed been released to space. In addition to the three science instruments, LADEE includes a Lunar Laser Communication Demonstration (LLCD) payload. LLCD has made history using a pulsed laser beam to transmit data over the 239,000 miles between the moon and Earth at a record-breaking download rate of 622 megabits per second (Mbps). LLCD is NASA's first system for two-way communication using a laser instead of radio waves. It also has demonstrated an error-free data upload rate of 20 Mbps transmitted from the primary ground station in New Mexico to the spacecraft currently orbiting the moon. "LLCD's goal is to validate and build confidence in the technology, so that future missions will consider using it," said Don Cornwell, LLCD manager at NASA's Goddard Space Flight Center in Greenbelt, Md. "The unique ability developed by the Massachusetts Institute of Technology's Lincoln Laboratory has incredible possibilities." In addition to LLCD, LADEE marks several other firsts. The mission is the first flight of a spacecraft developed at Ames, the first spacecraft launched on a U.S. Air Force Minotaur V rocket integrated by Orbital Sciences Corp., and the first deep-space mission to launch from NASA's Wallops Flight Facility in Virginia. Now that the commissioning phase has ended, LADEE has lowered its orbit to get closer to the lunar surface and begin its 100-day science mission. NASA's Science Mission Directorate in Washington funds the LADEE mission; a cooperative effort led by Ames, which manages the mission, built the spacecraft and performs mission operations. Goddard manages the science instruments and technology demonstration payload, and the science operations center. Wallops was responsible for launch vehicle integration, launch services, and launch range operations. NASA’s Marshall Space Flight Center in Huntsville, Ala., manages LADEE within the Lunar Quest Program Office. Much of the world was watching the Chang'e 3 landing in northern Mare Imbrium at 13:10 UTC Dec. 14, 2013. NASA’s Lunar Atmosphere and Dust Environment Explorer (LADEE) was watching too. In the evening of Friday, Dec. 13, Pacific Time, LADEE controllers uploaded a command sequence that scheduled the science instruments for operations during the Chang'e 3 landing period. LADEE's science instruments gathered data on the dust and gas species before and after the landing to provide the science team with a comparison. The Neutral Mass Spectrometer (NMS) was running in a mode that would allow it to monitor native lunar atmospheric species, as well as those resulting from Chang'e 3's propulsion system. These combustion products were known to include diatomic nitrogen, water, diatomic hydrogen and several other species. The two other LADEE science instruments, the Lunar Dust Experiment (LDEX) and the Ultraviolet-Visible Spectrometer (UVS), ran in their normal configurations. Together they are able to detect ejected dust and gas species from a propulsion system, provided these products could make the long trek to LADEE's position, which was far from the Chang’e-3 landing site. LADEE's retrograde, near-equatorial orbit never goes beyond approximately 22.5 degrees north and south latitude. Chang'e 3's landing site was far to the north of LADEE’s path, at 44.12 degrees north and 19.51 degrees west. At the time of landing, LADEE was orbiting over a different part of the moon east of the Chang'e 3 path, at 21.77 degrees south latitude and 82.17 degrees east longitude - more than 3,400 km (2,100 miles) away. At 13:41 UTC, about 30 minutes after the Chang’e 3 landing, LADEE flew over 19.51 degrees west longitude. At this time, LADEE was still more than 1,300 km (800 miles) to the south of the landing site. The NMS had started exosphere observations at 13:22 UTC and would continue for 55 minutes as LADEE sped across the lunar sunrise terminator and into lunar night. The UVS had performed atmospheric scans one orbit previous (LADEE's orbit period is about 2 hours), around 12:15 UTC, and would do so again later. The LDEX was operating normally, recording dust impacts prior to, during and after the Chang'e 3 descent. Surprisingly, the LADEE science teams' preliminary evaluation of the data has not revealed any effects that can be attributed to Chang'e 3. No increase in dust was observed by LDEX, no change was seen by UVS, no propulsion products were measured by NMS. Evidently, the normal native lunar atmospheric species seen by UVS and NMS were unaffected as well. It is actually an important and useful result for LADEE not to have detected the descent and landing. It indicates that exhaust products from a large robotic lander do not overwhelm the native lunar exosphere. As the descent video shows, the interval of time that dust was launched by the lander is very short, perhaps less than 15 seconds. LADEE would probably have had to be in just the right place at the right time to intercept it. Also, significant amounts exhaust products apparently cannot migrate to large distances (hundreds and thousands of miles) and linger with sufficient density to be measured. We can compare these results to theoretical predictions of gas and exhaust plume particle ejecta, and update our understanding of the interaction of lander propulsion systems with surface materials. In many ways, this has been a very useful experiment! Coupling a fortuitous orbital alignment with meticulous planning, a camera aboard NASA's Lunar Reconnaissance Orbiter caught a smeared glimpse of another moon probe in an image released Wednesday. LRO and the Lunar Atmosphere and Dust Environment Explorer, or LADEE, mission are NASA's two probes currently flying around the moon. The two satellites fly in different orbits and only occasionally pass near each other. But scientists in charge of the Lunar Reconnaissance Orbiter Camera calculated how to record a view of LADEE on Jan. 14 as the two probes traveled at near-perpendicular angles more than 20 miles over the moon's tortured surface. "Since LROC is a pushbroom imager, it builds up an image one line at a time, thus catching a target as small and fast as LADEE is tricky! Both spacecraft are orbiting the moon with velocities near 1600 meters per second (3600 mph), so timing and pointing of LRO needs to be nearly perfect to capture LADEE in an LROC image," wrote Mark Robinson, LROC's principal investigator at Arizona State University in Tempe. During the Jan. 14 encounter, controllers commanded LRO to roll 34 degrees to the west to line up the spacecraft's narrow-angle camera with LADEE's expected position on its flight path. 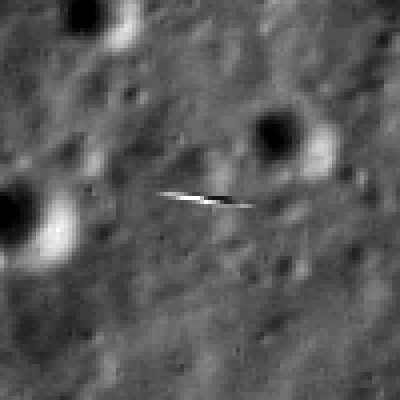 LRO's imager was designed to snap sharp pictures of the moon, not fast-moving nearby spacecraft, so the initial result showed LADEE as a smeared streak backdropped by a clear landscape of lunar craters. Scientists used a technique known as geometric correction to sharpen the view of LADEE, but the spacecraft is still blurry. The corrected image also had the result of smearing the lunar landscape in the background. 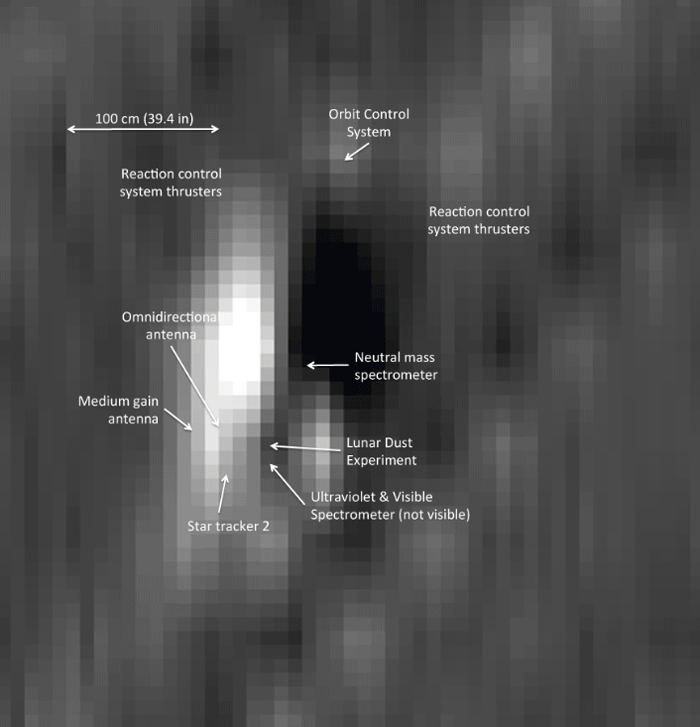 "Despite the blur it is possible to find details of the spacecraft, which is about 1 meter wide and 2 meters long. You can see the engine nozzle, bright solar panel, and perhaps a star tracker camera (especially if you have a correctly oriented schematic diagram of LADEE for comparison)," Robinson wrote. LRO launched in June 2009 to map the lunar surface and complete a geological survey of the moon, revealing new insights into how the moon formed and evolved, creating a global lunar atlas, and helping scientists find deposits of watery compounds. Since arriving in lunar orbit in October, LADEE achieved the first high-speed laser communications link-up between the moon and Earth and is now collecting data on the moon's tenuous atmosphere. 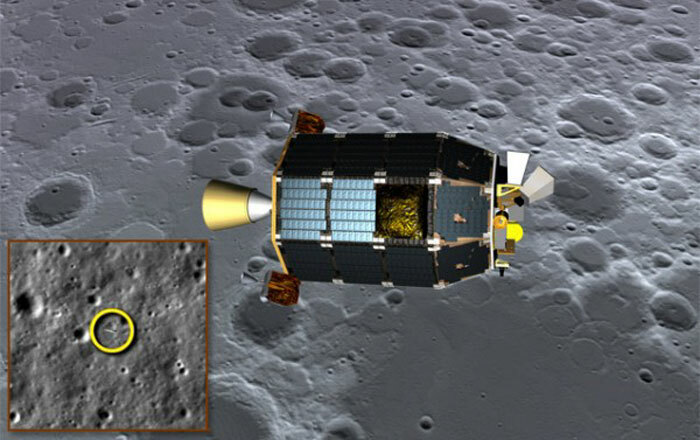 LRO and LADEE were joined at the moon in December by China's Chang'e 3 lander, which deployed a small mobile rover. LRO's camera has already imaged the Chinese probe on the lunar surface. With precise timing, the camera aboard NASA's Lunar Reconnaissance Orbiter (LRO) was able to take a picture of NASA's Lunar Atmosphere and Dust Environment Explorer (LADEE) spacecraft as it orbited our nearest celestial neighbor. The Lunar Reconnaissance Orbiter Camera (LROC) operations team worked with its LADEE and LRO operations counterparts to make the imaging possible. LADEE is in an equatorial orbit (east-­to-­west) while LRO is in a polar orbit (south-­to-­north). The two spacecraft are occasionally very close and on Jan. 15, 2014, the two came within 5.6 miles (9 km) of each other. As LROC is a push-broom imager, it builds up an image one line at a time, so catching a target as small and fast as LADEE is tricky. Both spacecraft are orbiting the moon with velocities near 3,600 mph (1,600 meters per second), so timing and pointing of LRO must be nearly perfect to capture LADEE in an LROC image. LADEE passed directly beneath the LRO orbit plane a few seconds before LRO crossed the LADEE orbit plane, meaning a straight down LROC image would have just missed LADEE. The LADEE and LRO teams worked out the solution: simply have LRO roll 34 degrees to the west so the LROC detector (one line) would be in the right place as LADEE passed beneath. As planned at 8:11 p.m. EST on Jan. 14, 2014, LADEE entered LRO’s Narrow Angle Camera (NAC) field of view for 1.35 milliseconds and a smeared image of LADEE was snapped. LADEE appears in four lines of the LROC image, and is distorted right­to­left. What can be seen in the LADEE pixels in the NAC image? Step one is to minimize the geometric distortion in the smeared lines that show the spacecraft. However, in doing so the background lunar landscape becomes distorted and unrecognizable (see above). 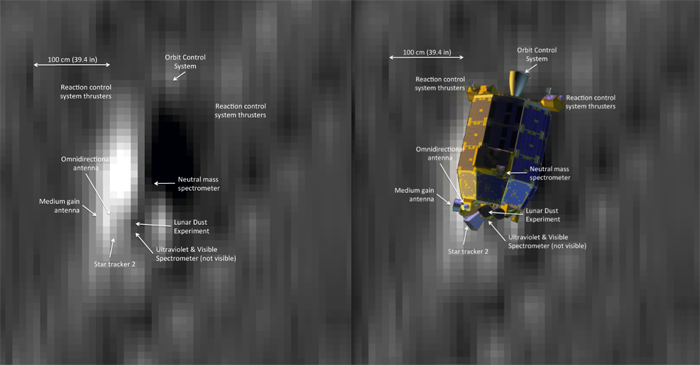 The scale (dimension) of the NAC pixels recording LADEE is 3.5 inches (9 cm), however, as the spacecraft were both moving about 3,600 mph (1,600 meters per second) the image is blurred in both directions by around 20 inches (50 cm). So the actual pixel scale lies somewhere between 3.5 inches and 20 inches. 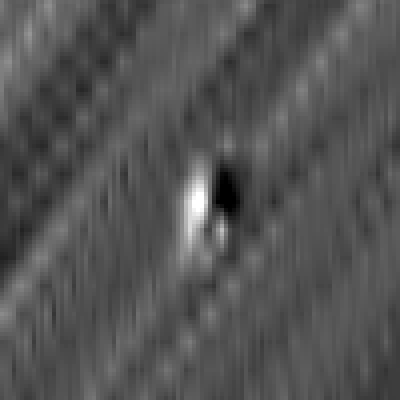 Despite the blur it is possible to find details of the spacecraft, which is about 4.7 feet (1.9 meters) wide and 7.7 feet (2.4 meters) long. The engine nozzle, bright solar panel and perhaps a star tracker camera can be seen (especially if you have a correctly oriented schematic diagram of LADEE for comparison). LADEE was launched Sept. 6, 2013. LADEE is gathering detailed information about the structure and composition of the thin lunar atmosphere and determining whether dust is being lofted into the lunar sky. LRO launched Sept. 18, 2009. LRO continues to bring the world astounding views of the lunar surface and a treasure trove of lunar data. NASA’s Goddard Space Flight Center in Greenbelt, Md., manages the LRO mission. NASA's Ames Research Center in Moffett Field, Calif., manages the LADEE mission. 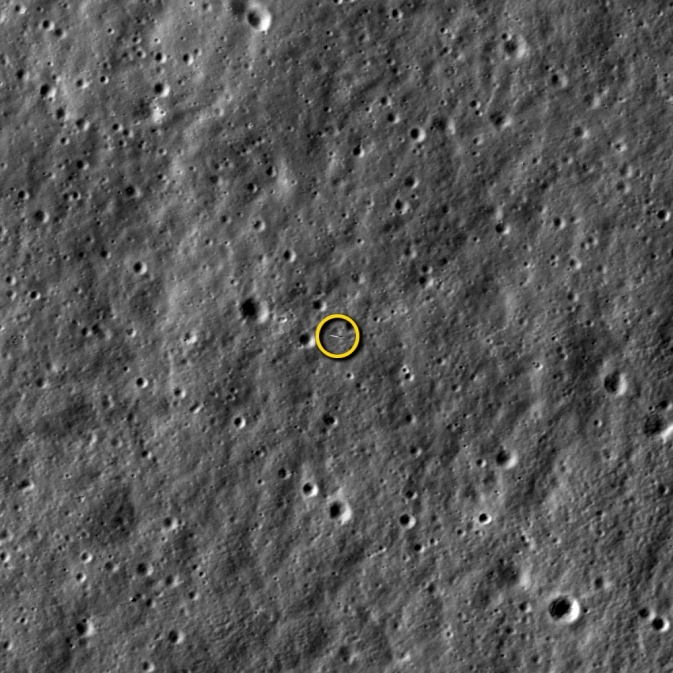 This subsection of the LRO image, expanded four times, shows the smeared view of LADEE. Last month our attention-hounding moon photobombed SDO’s pictures of the sun, and now it’s gotten in the way of yet another robot spacecraft’s view: NASA’s Lunar Atmosphere and Dust Environment Explorer, aka LADEE, which was just trying to take some nice pictures of the stars. What gives, moon? Actually these are images of the Moon intentionally captured by LADEE’s star tracker cameras on Feb. 8, 2014, at 23:45 UTC (6:45 p.m. ET). The star tracker instrument is a wide-angle camera that’s used by the spacecraft to determine its orientation in space based on the known positions of background stars. Star trackers aren’t specifically designed for taking pretty pictures of things like planets and moons “but they can sometimes provide exciting glimpses of the lunar terrain,” according to LADEE project manager Butler Hine. The five images of the moon captured on Feb. 8 are the first ones to be downlinked by the LADEE team. Taken at one-minute intervals while the spacecraft was traveling along its 156-mile-high equatorial orbit at a velocity of about 60 miles/minute (3,600 mph), the images show various craters, mountain ranges, and lava plains on the lunar surface. Im Empfangsteleskop fokussiertes Empfangssignal von der Mondsonde, links mit geringen atmosphärischen Störungen (enge Konzentration der Intensität), rechts bei starken atmosphärischen Turbulenzen (führt zu einer Aufweitung des fokalen Intensitätsmusters). Rund 400 000 Kilometer hatte das Laserlicht zurückgelegt und die Erdatmosphäre durchquert, bevor es von der optischen Bodenstation der ESA auf Teneriffa empfangen wurde. Gesendet wurde das Signal vom Lunar Lasercomm Space Terminal (LLST) an Bord der NASA-Sonde LADEE, die seit Oktober 2013 um den Mond kreist. Wissenschaftler des Deutschen Zentrums für Luft- und Raumfahrt (DLR) haben nun in Kooperation mit der ESA das LLST-Signal mit der Zielkamera und einem schnellen Sekundärsensor analysiert. Damit wurde erstmals nun auch von Europäern ein optischer Link durch die Erdatmosphäre nach seinem langen Weg durch den Weltraum vermessen. Das LLST bildet zusammen mit seiner Bodenstation in White Sands im US-Bundesstaat New Mexico das „Lunar Laser Communication Demonstration“ (LLCD)-Experiment der Lincoln Labs des Massachusetts Institute of Technology (MIT). „Das Experiment hat erstmals die Kommunikation über einen optischen Link vom entfernten Mond zur Erde erfolgreich demonstriert", betont Dr. Igor Zayer, Leiter der Bodenstation-Subsysteme bei der ESA in Darmstadt. Die ESA hat hierbei – in einer Kooperation mit der NASA und dem MIT – mit ihrer Bodenstation auf Teneriffa am Experiment teilgenommen und erfolgreich mit der Sonde kommuniziert. Das Ergebnis der DLR-Signalauswertung: „Der Einfluss der Atmosphäre ist weniger stark als erwartet, die Qualität des Signals ist sehr gut“, sagt Dirk Giggenbach vom DLR-Institut für Navigation und Kommunikation in Oberpfaffenhofen. Erfahrungen mit den erforderlichen Sensoren und Algorithmen für die Auswertung hatte das Team des Instituts bereits bei Testreihen mit der Übertragung eines Laserstrahls von einem Flugzeug und von verschiedenen niedrigfliegenden Satelliten gewonnen. Die Daten des LLCD-Experiments wurden von drei optischen Bodenstationen – den amerikanischen Stationen White Sands und Table Mountain sowie der Empfangsstation der ESA auf Teneriffa – empfangen. Das Interesse an der neuen Technologie ist groß: Die bisher erprobte und verwendete Technik, über Radio- und Mikrowellen zu kommunizieren, erreicht ihre Grenzen. Die kurzwelligeren optischen Trägerfrequenzen hingegen bieten höhere Datenraten. Die Blu-Ray-Version des Hollywoodfilms „Apollo 13“ würde mit seinen 36 800 MB gerade einmal 7,9 Minuten vom Mond zur Erde benötigen. Würde der Film über die S-Band-Verbindung der Sonde übertragen, müsste man auf der Erde beinahe 639 Stunden – und somit fast einen Monat – auf die Daten warten. „Zukünftige Missionen können erheblich vom Einsatz der optischen Kommunikation profitieren, da mehr Daten in kürzerer Zeit zur Erde übertragen werden können.“ Für Mond- oder planetare Missionen könnte diese Art der Datenübertragung hilfreich sein und Rover könnten hochaufgelöste 3D-Aufnahmen in Echtzeit übermitteln. THE WOODLANDS, TEXAS—After decades of searching, NASA scientists have detected the veil of dust kicked up by tiny meteoroid impacts on the moon. The Apollo astronauts and many spacecraft had tried to detect sunlight reflected from the dust and failed. So, instead, the scientists of the Lunar Atmosphere and Dust Environment Explorer (LADEE) spacecraft used an onboard instrument that detects micrometer-size dust particles when they hit the instrument at several thousand kilometers per hour and vaporize. Orbiting the moon as low as a few tens of kilometers above the surface, LADEE detected a dust impact every minute or two on average except when a meteoroid shower hitting the moon kicked up many more times the debris. 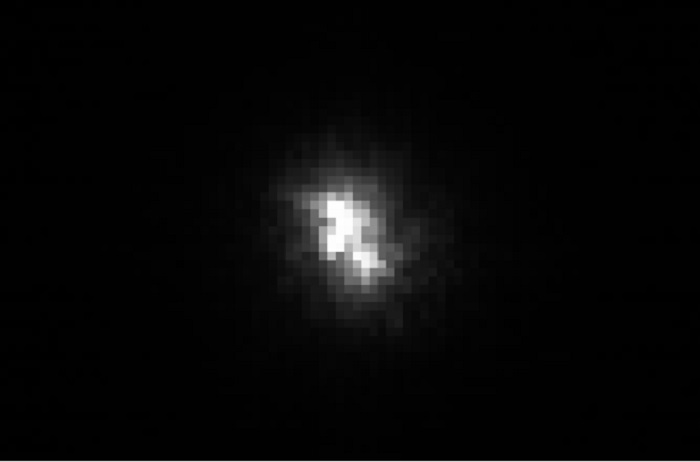 Researchers should be able to use these LADEE observations to see whether the impact debris blown off the moons of Pluto will present a hazard to the New Horizons spacecraft when it flies by the ice dwarf planet in July of next year. NASA's Lunar Atmosphere and Dust Environment Explorer (LADEE) spacecraft is gradually lowering its orbital altitude over the moon. LADEE will continue to make important science observations before its planned impact into the lunar surface later this month. LADEE mission managers expect the spacecraft will impact the moon’s surface on or before April 21. On April 11, ground controllers at NASA's Ames Research Center in Moffett Field, Calif., will command LADEE to perform its final orbital maintenance maneuver prior to a total lunar eclipse on April 15, when Earth’s shadow passes over the moon. This eclipse, which will last approximately four hours, exposes the spacecraft to conditions just on the edge of what it was designed to survive. This final maneuver will ensure that LADEE's trajectory will impact the far side of the moon, which is not in view of Earth and away from any previous lunar mission landings. There are no plans to target a particular impact location on the lunar surface, and the exact date and time depends on several factors. "The moon's gravity field is so lumpy, and the terrain is so highly variable with crater ridges and valleys that frequent maneuvers are required or the LADEE spacecraft will impact the moon’s surface," said Butler Hine, LADEE project manager at Ames. "Even if we perform all maneuvers perfectly, there's still a chance LADEE could impact the moon sometime before April 21, which is when we expect LADEE's orbit to naturally decay after using all the fuel onboard." Anyone is eligible to enter the "Take the Plunge: LADEE Impact Challenge." Winners will be announced after impact and will be e-mailed a commemorative, personalized certificate from the LADEE program. The submissions deadline is 3 p.m. PDT Friday, April 11. LADEE's mission marked several firsts. It was the first demonstration of Optical Laser Communications from space (sent data six times faster than radio), and the first deep space spacecraft designed and built "in house" at NASA’s Ames Research Center. It was also the first payload to launch on a U.S. Air Force Minotaur V rocket integrated by Orbital Sciences Corp., Va., and was the first deep space mission to launch from NASA's Goddard Space Flight Center's Wallops Flight Facility on Wallops Island, Va., when millions watched the night launch on Sept. 6, 2013. The vending-machine size spacecraft has been orbiting the moon since Oct. 6. On Nov. 10, LADEE began gathering science data, and on Nov. 20, the spacecraft entered its science orbit around the moon's equator. LADEE has been in extended mission operations following a highly successful 100-day prime science phase. LADEE's three science payload instruments have been working to unravel the mysteries of the lunar atmosphere and dust environment acquiring to date more than 700,000 measurements. In its previous orbit, LADEE's closest approach to the moon’s surface was between 20 and 50 km, and its farthest point was between 75 and 150 km – a unique position that allows the spacecraft to frequently pass from lunar day to lunar night, approximately every two hours. This vantage provides data about the full scope of changes and processes occurring within the moon's tenuous atmosphere. NASA is preparing one last blast for its expired Lunar Atmosphere and Dust Environment Explorer (LADEE) spacecraft — a controlled crash into the Moon’s surface, probably on 21 April. But before it goes, LADEE will take a final shot at unravelling one of the main mysteries it went to the Moon to uncover. A major goal of the mission was to understand a bizarre glow on the Moon’s horizon, spotted by Apollo astronauts just before sunrise. “So far we haven’t come up with an explanation for that,” project scientist Rick Elphic, of NASA’s Ames Research Center in Moffett Field, California, said at a media briefing on 3 April. One leading idea is that the Sun’s ultraviolet rays cause lunar dust particles to become electrically charged. That dust then lofts upwards, forming a cloud that caught the light and the astronauts’ eyes. LADEE carries an instrument that measures the impact of individual dust particles, as well as the collective signal from smaller particles. Lunar scientists had expected a certain amount of tiny dust to explain what the Apollo astronauts saw. But LADEE didn’t find it. “We did measure a signal that indicates that the amount of lofted dust has to be at least two orders of magnitude below the expectations that were based on the Apollo reports,” says Mihály Horányi, the instrument’s principal investigator, who is at the University of Colorado. Perhaps the dust lofting happens only occasionally, he suggests, and the astronauts were in just the right place at the right time to see it. LADEE will try one more time to unravel the horizon-glow mystery. As it gets closer and closer to the lunar surface, it will point its star tracker towards the Moon’s horizon to try to replicate the angle and conditions under which the astronauts saw the glow. The star tracker is not designed for high-resolution imaging, but Elphic says that it’s worth looking. This weekend, mission managers will guide LADEE on a trajectory just 3 kilometres above the Apennine mountains on the Moon’s near side. The goal is to see what sort of dust LADEE can spot so close to the surface. Then it will move slightly higher for its remaining few weeks before plunging to its doom. It is destined to follow the natural decay of its orbit and vaporize itself on the lunar far side. LADEE scientists have plenty of science to distract them from mourning. The spacecraft made the best measurements ever of the Moon’s dusty envelope, generated as tiny meteorites bombard its surface. The mission also discovered exotic atoms such as neon, magnesium and aluminium in the Moon’s outer atmosphere. LADEE lacked fuel to maintain a long-term lunar orbit or continue science operations and was intentionally sent into the lunar surface. The spacecraft's orbit naturally decayed following the mission's final low-altitude science phase. "At the time of impact, LADEE was traveling at a speed of 3,600 miles per hour – about three times the speed of a high-powered rifle bullet," said Rick Elphic, LADEE project scientist at Ames. "There’s nothing gentle about impact at these speeds – it’s just a question of whether LADEE made a localized craterlet on a hillside or scattered debris across a flat area. It will be interesting to see what kind of feature LADEE has created." On April 11, LADEE performed a final maneuver to ensure a trajectory that caused the spacecraft to impact the far side of the moon, which is not in view of Earth or near any previous lunar mission landings. LADEE also survived the total lunar eclipse on April 14 to 15. This demonstrated the spacecraft's ability to endure low temperatures and a drain on batteries as it, and the moon, passed through Earth's deep shadow. In the coming months, mission controllers will determine the exact time and location of LADEE's impact and work with the agency’s Lunar Reconnaissance Orbiter (LRO) team to possibly capture an image of the impact site. Launched in June 2009, LRO provides data and detailed images of the lunar surface. "It's bittersweet knowing we have received the final transmission from the LADEE spacecraft after spending years building it in-house at Ames, and then being in constant contact as it circled the moon for the last several months," said Butler Hine, LADEE project manager at Ames. Launched in September 2013 from NASA's Wallops Flight Facility in Virginia, LADEE began orbiting the moon Oct. 6 and gathering science data Nov. 10. The spacecraft entered its science orbit around the moon's equator on Nov. 20, and in March 2014, LADEE extended its mission operations following a highly successful 100-day primary science phase. NASA’s LADEE mission ended with a bang when the spacecraft crashed into the lunar surface Thursday. The Lunar Atmosphere and Dust Environment Explorer smashed into the dark side of the moon between 9:30 and 10:22 p.m., according to NASA officials. The vending-machine-sized spacecraft ran out of fuel and collided with the moon at a speed of roughly 3,600 miles per hour -- or “about three times the speed of a high-powered rifle bullet,” Rick Elphic, LADEE project scientist at NASA Ames Research Center said in a statement. The doomed satellite encountered so much heat -- hundreds of degrees -- that as it broke up during impact, parts of it may have even vaporized. The moon has an extremely lumpy gravity field, and so LADEE’s handlers have had to maneuver often to keep it from veering out of orbit and then falling to the surface. But before the spacecraft’s final dive, the team was able to bring it into a very low orbit, allowing them a rare opportunity to make measurements from less than a mile above the lunar surface. LADEE, launched in September 2013, was sent to study the moon’s exceedingly thin lunar atmosphere. In this sparse "exosphere," the molecules are so far apart that they don't run into each other. The researchers were also looking to solve a decades-old mystery that began when Apollo astronauts saw bright streamers stretching across the lunar heavens. Scientists think this phenomenon was caused by tiny dust grains kicked many miles into the air becoming electrically charged by sunlight, but they hadn’t been able to test that theory before. LADEE was also the first mission to use laser instead of radio waves for two-way communication, allowing it to transmit boatloads of data at a record-breaking speed of 622 megabits per second. Using laser instead of radio allowed them to transmit data six times faster, using half the weight in equipment at 25% less power, Don Cornwell, the mission manager for the Lunar Laser Communications Demonstration, said before the launch. The mission’s launch also became infamous with the inadvertent launch of the "rocket frog" -- an aerial amphibian caught on camera as the rocket carrying LADEE roared to life and apparently blasted the poor animal sky-high. In the coming months, scientists hope to pinpoint when the spacecraft actually hit the ground. They also want to use NASA’s Lunar Reconnaissance Orbiter to take photos of the crash site, to see what shape the debris left in the lunar surface. LADEE Project Scientist Update: The Legacy Lives On! NASA's Lunar Atmosphere and Dust Environment Explorer (LADEE) spacecraft has impacted the Moon, capping an extremely successful operational mission. Science analysis will continue for months, as the science teams churn through the data and write papers about their findings. So LADEE is gone, but its science legacy lives on! LADEE ran its science instruments almost non-stop right up to impact the evening of April 17, 2014, in an effort to gather as much low-altitude data as possible. Further study of the returned data will reveal what the instruments saw at these amazingly low orbits, just a few kilometers above the surface. Early results suggest that LADEE was low enough to see some new things, including increased dust density and possibly new atmospheric species. In an incredible race with time, LADEE’s Real Time Operations team queued and downloaded all science files just minutes prior to LADEE's impact. As the clock was running out on the LADEE mission, we took advantage of an opportunity to replicate observations by the Apollo astronauts more than 40 years ago. (We hinted at this in an earlier update). We used one of the star tracker cameras to gaze out over the Moon's horizon, while LADEE was in the deep darkness of the lunar night and over the far side where no Earthshine can reach. In the minutes before orbital sunrise, when LADEE emerged from shadow into sunlight, we commanded the spacecraft to take a series of images. We wanted to see the same scene the astronauts saw, with the sun just below the horizon. In this configuration, we could view anything that might scatter sunlight. On Earth, "rosy-fingered dawn" paints the sky prior to sunrise because aerosols and dust particles suspended in the atmosphere scatter the sunlight. With the sun below the horizon, the reflected and scattered light makes the sunrise glow for an observer to see in the dark shadow beyond. However, the very low dust densities that LADEE's Lunar Dust Experiment (LDEX) measured should not produce such a sunrise glow – there were just too few particles along the line of sight to scatter measurable light. Yet some Apollo astronauts reported a pre–sunrise glow and even rays of light, as if the sun was shining through notches of the lunar mountains, and the light was scattered by…something. Could LADEE spot this? Shown here is a series of images taken on one such occasion, Saturday, April 12. The series begins with LADEE viewing the lunar horizon ahead, a few minutes before orbital sunrise. At this position, there is already a glow in the sky above the completely dark surface of the Moon (right), though the sun is many degrees below the horizon. LADEE’s orbital motion makes the stars appear to move to the left. The same motion brings the sun closer to the horizon ahead and the glow gets brighter. In fact, the glow becomes so bright, parts of the image are saturated. Finally, sunrise fully saturates the camera image. This sequence is the closest thing to the astronaut's orbital viewpoint that LADEE could provide! The shape of this glow is familiar; we've seen it before. The images reveal a phenomenon that even we can see during a dark, clear night after sunset here on Earth – the zodiacal light. What is zodiacal light? It is the scattered sunlight from billions upon billions of dust grains, not at the Moon, but in the innermost reaches of the solar system. The origin of this dust appears to be comets, which shed gas and dust in their orbital progress around the sun. The lenticular shape of the zodiacal light, seen in the LADEE star tracker images, results from the tendency of the dust to be more concentrated near the orbital plane of the planets. Unlike Eugene Cernan's sketches from his vantage point in the Apollo 17 command module, America, LADEE saw no rays or other strange features - just good old zodiacal light, plus possibly the outer fringes of the sun's corona. LADEE took several sequences of these orbital sunrise images, and for now, nothing has shown up that clearly is lunar in origin. In the coming weeks and months, we'll carefully analyze these images, and perhaps something related to levitated lunar dust will emerge.